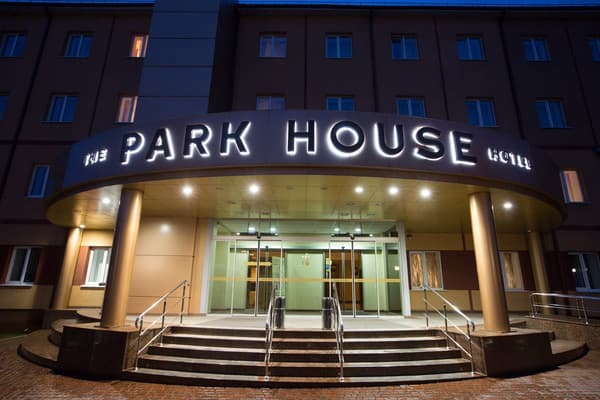 Hotel and restaurant complex "Park House" is located in a private park area, 9 km from the city center in a protected area. It offers accommodation in 103 rooms of various categories. 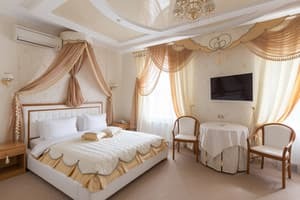 Comfortable hotel rooms in the style of art-decor are fully equipped with air conditioning, international TV, mini - bar and a bathroom. The special atmosphere and reasonable luxury in exclusive copyright rooms. Residing at the hotel have free Wi-Fi and parking. For true connoisseurs of exotic winter garden, fitness center, SPA-salon, a Finnish sauna and an indoor pool. Food and rest in a restaurant of the highest category, European cuisine, live music (piano, jazz guitar), banquet hall and summer terrace near the fountain. Distance from the hotel "Park House" to the airport - 40 km, the train station - 13 km. Description of the room: The room area is about 20 m2. Furniture: bed (0,9m x 2,0m), bedside table, desk with appropriate accessories, wardrobe, luggage cabinet. Description of the room: The room area is 32 m2. Furniture: double bed (1.6m x 2.0m), two bedside tables, desk with accessories, upholstered furniture, coffee table, mirrored wardrobe, luggage cabinet. Description of the room: The room area is about 32 m2. Furniture: two free-standing beds (0,9m x 2,0m), two bedside tables, a desk with the appropriate accessories, a TV and mini-bar, a mirror wardrobe, a luggage cabinet. 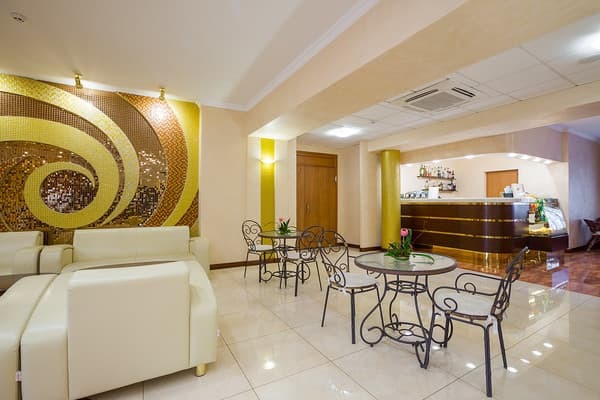 Technical facilities: air conditioning inverter type, heating system with individual temperature control, TV, minibar, telephone, wireless Internet access. Sanitary equipment: shower, necessary personal hygiene. Description of the room: Double room for newlyweds. Description of the room: The room consists of an entrance hall, a living room and a bedroom. The total area is about 50 m2. In the hallway there is a mirrored wardrobe, a luggage cabinet, a hanger. In the living room there are two soft chairs and a comfortable sofa, a TV-table and a mini-bar, a coffee table. The bedroom is very spacious, with a double bed (1.6m x 2.0m), bedside tables, a wide desk with matching accessories. 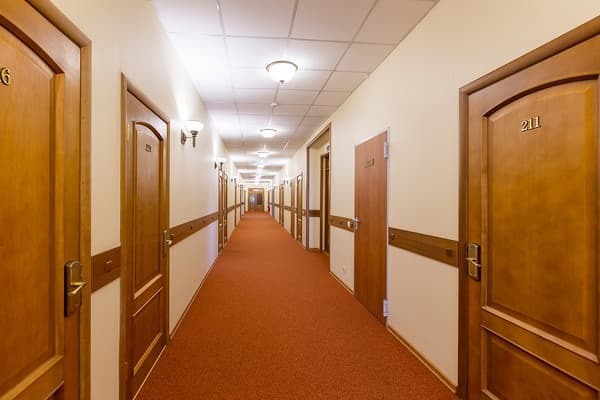 Description of the room: The area of ​​the room is 140 m2. 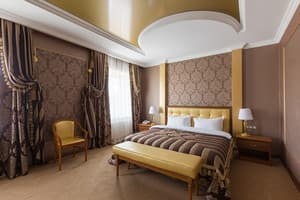 A large, comfortable, luxurious and at the same time very cozy room. It consists of an entrance hall, a hall-living room, an office, a bedroom, a guest and a private bathroom. In the room there is a separated room-bedroom with a bathroom (for accompanying persons). 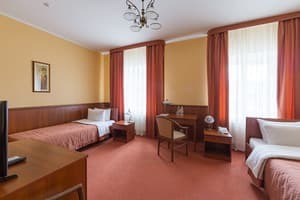 The room is equipped with modern comfortable furniture: a double bed, bedside tables, dressing table, wardrobes; a sufficient number of soft sofas, a carved desk, wardrobes for books and papers. 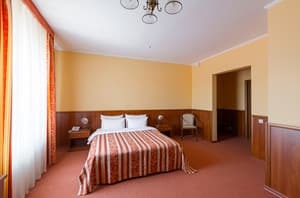 Technical facilities: air conditioning inverter type, heating system with individual temperature control, TV sets with LCD screens, mini-bar, telephones, wireless Internet access. В номере есть электрочайник и посуда, но чая или кофе, сахара в наличии не оказалось. Не логично. В остальном все гууд! Отличный дизайн, наличие в обычном стандарте даже банного халата, возможность до позднего вечера позаниматься в фитнес-клубе или поплавать в бассейне. Особенно понравилось наличие бассейна и спортзала. Is free! All children under 5 years using existing bedding stay free of charge. All children under 2 years in cots are charged UAH 100 per person per night. All older children or adults are charged UAH 200 per person per night. Maximum capacity of extra beds / cots in the room - 1. Extra beds and cots are available on request. 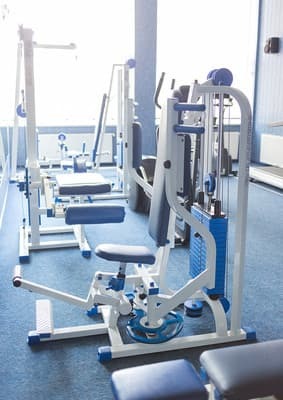 Supplements will not be calculated automatically in the total costs and have to be paid separately at the hotel. A restaurant serving European cuisine. The cost of additional breakfast - 85 UAH. The park area of ​​the city. Airfreight: Kryvyi Rih International Airport (Ukr. Mіzhnarodny the airport "Kryvyy Rih») (IATA: KWG, ICAO: UKDR) is located 40 km from the hotel "Park House" in the village Lozovatka. Between the airport and city center runs a taxi. Trains: F / D station Kryviy Rih-Main is located 13 km from the hotel "Saksagan". Bus: Bus station Krivoy Rog is located 11 km from the hotel "Saksagan". Transport interchange: in stop "Bolshevik", "Pioneer"